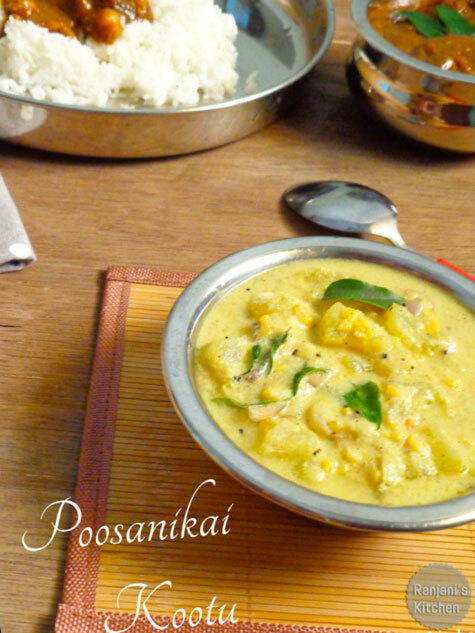 Ashgourd Kootu – Poosanikai Kootu – Healthy and tasty accompaniment for all kind of rice. Here is how to make poosanikai kootu. Peel the outer skin of Poosanikai and halve it. Just take off the seeds from inner part , wash thoroughly and cut them into small cubes. Cook this with 2 cups of water by adding a pinch of turmeric and salt. Meanwhile pressure cook channa dal, mash it and keep aside. Grind Coconut, green chillies and cumin seeds together as a smooth paste and set aside. Now add the mashed channa dal to cooked ash gourd. Allow it to boil then add the grounded paste to it. Let it cook for 4 to 5 mins. 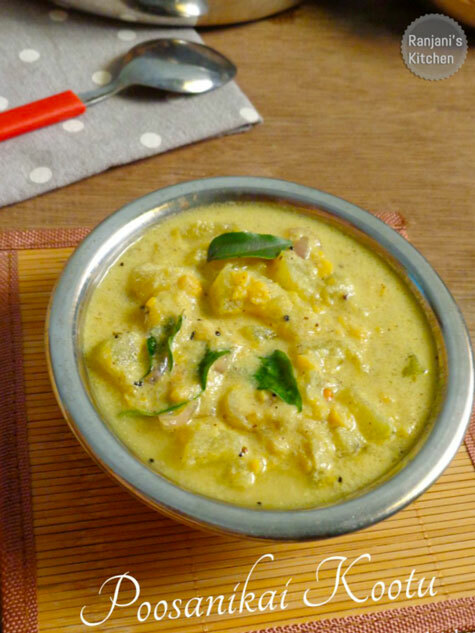 Turn off the flame once the kootu becomes thicken and the veggie get cooked soft. Add hing while tempering if you want. But its purely optional. Don’t mash the veggie while cooking. In place of channa dal, you can replace Moong dal or thoor dal.